Ten-year-old Alexia had been worried about her baby sister Ayla as the one-year-old endured cancer treatments. When Alexia received a special Sibling Courage Kit from the Cooper Trooper Foundation, it was “a nice surprise that she got something for herself,” says her mom, Dana Ochoa. 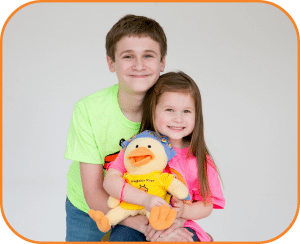 As part of a new partnership between Gabe’s Chemo Duck and Cooper Trooper Foundation, Huggable Hope ducks are now included in the Courage Kits distributed to siblings of children diagnosed with cancer at Monroe Carell Jr. Children’s Hospital at Vanderbilt (MCJCHV). Courage Kits are also available by request online. “Huggable Hope ducks are a great addition to our Courage Kits,” says Missy Cook, who founded the Cooper Trooper Foundation with her husband, Rod, after their youngest son, Cooper, was diagnosed with a rare type of cancer and they recognized a huge need for hospital-based sibling resources for parents. Courage Kits also include a tee-shirt, courage medal, journal/pen, personalized certificate, a book for siblings of children diagnosed with a chronic illness and more. Both Gabe’s and Cooper Trooper are the result of families personally touched by childhood cancer. “We realize how devastating it can be,” says Cook. Purchase a Huggabe Hope for someone you love today!